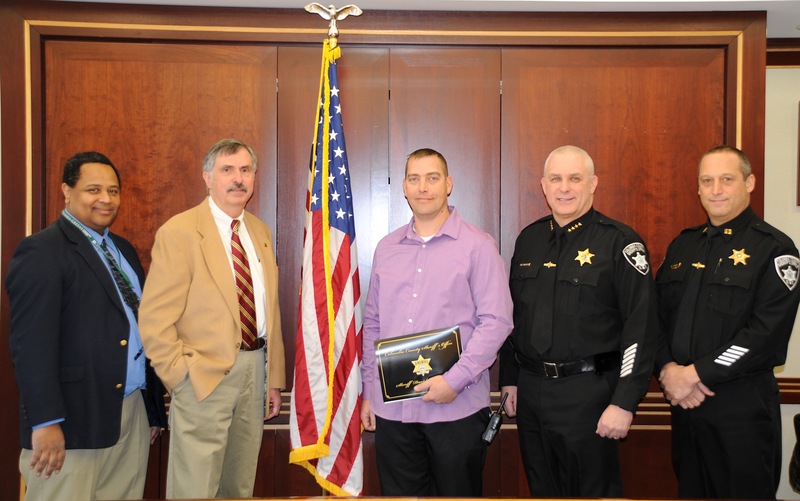 Deputy Sheriff Patrick Mayo, currently assigned to Columbia-Greene Community College, has been presented with the Life Saving Award by the Columbia County Sheriff’s Office. The award is presented to members of the Sheriff’s office in recognition of an act performed in the line of duty, which through disregard for personal safety or through prompt and alert action, results in the saving of a life. Pictured from left to right are: Joseph Watson, Ph.D., vice president and dean of students and enrollment management at C-GCC; C-GCC President James R. Campion; Deputy Sheriff Patrick Mayo; Columbia County Sheriff David P. Bartlett, and Columbia County Sheriff’s Office Captain John DeRocha.